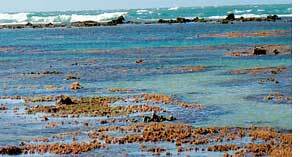 A RED alga grown commercially for its starch extract in the Gulf of Mannar, off Tamil Nadu, is said to be choking the coral reef in the protected area. There is no conclusive finding whether the corals are threatened, but the state forest department is not taking chances. It has decided to weed them manually. "There is no estimate how far the algal cover extends. We are not sure how much manpower or time will be needed but we are determined to start removing the algae," said S Shenbagamoorthy, wildlife warden of the reserve. The algal species, Kappaphycus alvarezii, is a source of a complex carbohydrate--carregeenan--used as a gelling agent in a range of products, from ice cream to shoe polish. The Central Salt and Marine Chemicals Research Institute (csmcri), a government agency, promoted its cultivation initially. For the past five years some scientists have been arguing the algae have become invasive thereby threatening to overrun the species native to the ecosystem. In 2005, scientists from the National Institute of Oceanography suggested in an article in Current Science that the algae had become invasive. A study by researchers from Madurai in 2007-2008 also came to the same conclusion. They studied the algal growth off Kurusadai Island in the Palk Straits where the algae was cultivated earlier. "Our study clearly shows the algae has spread over the corals off the island and in the Mandapam region (Ramanathapuram district)," said S Chandrasekaran of Thiagarajar College, Madurai, who led the research. csmcri refuted both studies. "There are two small patches of Kappaphycus outside the original cultivation area that add up to just 7 sq m," said Pushpito Ghosh, director of csmri. "Multi-nationals and self-help groups cultivate the alga and we get the flak. But we will conduct annual surveys to check if it turns invasive," Ghosh added.